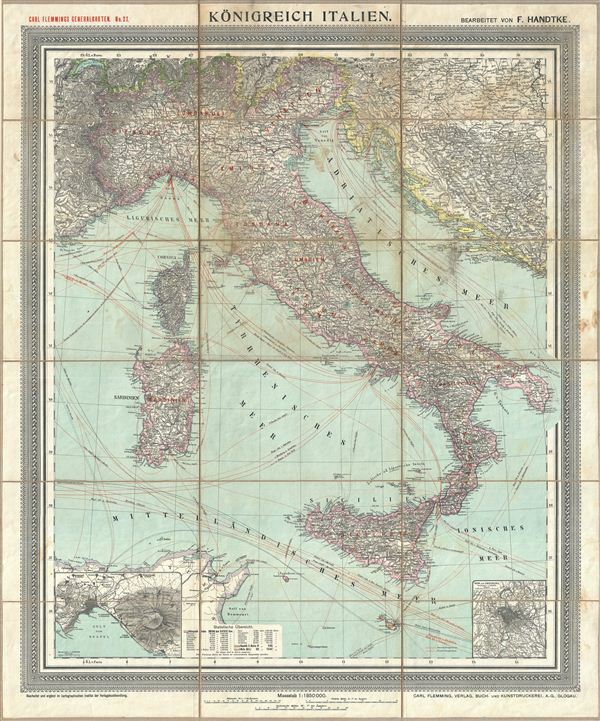 An appealing c. 1890 large format map of Italy issued by Carl Flemming and Friedrich Handtke. The map covers the Italian peninsula in full from the Alps to Sicily, including Malta, Sardinia, Pantelleria, and Corsica. An inset map in the lower left quadrant details the vicinity Napoli (Naples) and another in the lower right focuses on Rome. Numerous shipping lands throughout the Mediterranean are shown. The whole is embraced in a wide decorative border and has been dissected and mounted on linen in 18 panels. This is a late edition of this map published well after the 1878-1879 deaths of the mapmakers, Carl Flemming and Friedrich Handtke. Carl Flemming (fl. c. 1840 - c. 1879) was a German cartographer and map publisher active in the late 19th and early 20th centuries. The firm was an early adopter of modern multicolor printing techniques, which it utilized to produce low cost attractive maps focused on the German market. The firm is also known for its children's books. Flemming died in 1878 or 1879, but his firm continued to publish well into the 20th century. Flemming was based in Glogow, a region that is currently part of modern day Poland's Lower Silesian Voivodeship. Friedrich Handtke (December 7, 1815 - January 25, 1879) was a German engraver and cartographer active in the second half of the 19th century. Handtke was formally trained as a surveyor in the Prussian army. Following his discharge in 1838 he took a position as the head of cartography at the Glogow publishing house of Carl Flemming. Initially, Handtke, in an attempt to hide his youth inscribed his map publications as "Dr. Karl Sohr". From 1838 to 1874, Handtke and Flemming issued some 260 maps, about 168 of which Handke drew himself. Both Flemming and Handke died in 1879 leaving the powerful Flemming publishing house without its heads. Nonetheless, the firm continued to publish, and republish, well into the 20th century. Glogow, where Handtke was based, is currently part of modern day Poland's Lower Silesian Voivodeship. Good condition. DIssected and mounted on linen. Some foxing.